The Tag Heuer Formula 1 Men’s Stainless Steel Case Black Rubber Strap Watch WAH1110.FT6024 is a casual, comfortable, but high quality sports watch inspired by the McLaren Formula 1 Racing Team. It offers no-fuss, practical functionality combined with rugged good looks for the no-nonsense man. 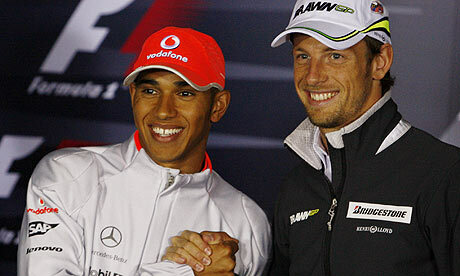 This is the watch worn by champion British race car drivers Lewis Hamilton and Jenson Button, and it is easy to see why. The round black dial features large, white, and easy to read minute numerals on the bezel, in addition to large hour numbers on the dial at 12, 3, 6 and 9 o’clock with graphical markers for the hours and minutes between. Luminescent hands complete the easy-to-read-at-a-glance appeal of this timepiece, along with a bright red seconds hand. The date is also displayed in a small window between the 4 and 5 o’clock positions. This is the watch for any man who does not want to fool with showy chronographs or other self-conscious gadgetry on his watch face, but demands quality, practicality and durability. The black rubber wristband, with adjustable clasp, is comfortable and casual, yet adds to the rugged appeal of this fine sports watch. Another great feature is the end-of-life battery indicator, which prevents the sudden, unpleasant discovery of a dead battery. When the battery begins to weaken, the red seconds hand makes four-second jumps, rather than one-second jumps, preserving the correct time, until the battery is exhausted. This is not available on Formula 1 models with chronograph features, and is another example of the fine practicality of this specific model. Circular black dial with luminous silver-tone minute and hour hands. White hour and minute markings on bezel and luminous dial. Date window between 4 and 5 o’clock position. Stainless steel, unidirectional rotating bezel. Scratch-resistant and anti-reflective sapphire crystal. Battery service life of at least 2 years. Case is fine-brushed and polished stainless steel. Bezel is rotatable polished steel, black PVD titanium. Strap is black rubber, 20mm wide, with folding clasp. If the temperature changes suddenly, a slight amount of condensation may appear under the sapphire crystal of your watch. This should dissipate by itself and will not affect the watch’s functionality. However if the condensation persists, this could be a sign that one of the rubber seals on the watch needs adjusting. Because of the potential weakening of these same seals, Tag Heuer recommends that all of their Formula 1 watches be given an annual check-up by one of their official dealers. It would also be great if there was an alarm feature on this watch. It is, I think, the only really practical feature that is missing, from this highly practical timepiece. There are other versions of this exact watch available with red, green, or white dials, although only the green and black models have a rubber wristband. There are also greater variations, within the Formula 1 collection, including choices of stainless steel or rubber watchband, alarm, and chronograph features. Please see tagheuer.com for more information. Personally, I don’t believe that an $1100 watch, should show signs of wear or slippage after only one year. But there is no doubt this is a fine quality quartz movement timepiece, with excellent design features. 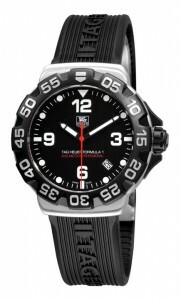 Tag Heuer recommends an annual check-up for all of their watches, with an emphasis on their intricate features; and the company shows a finely detailed attention to maintenance, as well as to their reputation for excellence. I have the rubber strap with buckle. with regular use, how long will the rubber lasts before it looses its color or torn ?